"a thing of immortal make, not human, lion-fronted and snake behind, a goat in the middle." "She was the mother of Chimaera who breathed raging fire, a creature fearful, great, swift-footed and strong, who had three heads, one of a grim-eyed lion; in her hinderpart, a dragon; and in her middle, a goat, breathing forth a fearful blast of blazing fire. Her did Pegasus and noble Bellerophon slay"
The Chimera, is a mixture of creatures, known as a lion/goat/snake hybrid or a lion/dragon/goat/snake hybrid monster and as a spawn of Echidna, that served as an omen of great disaster. 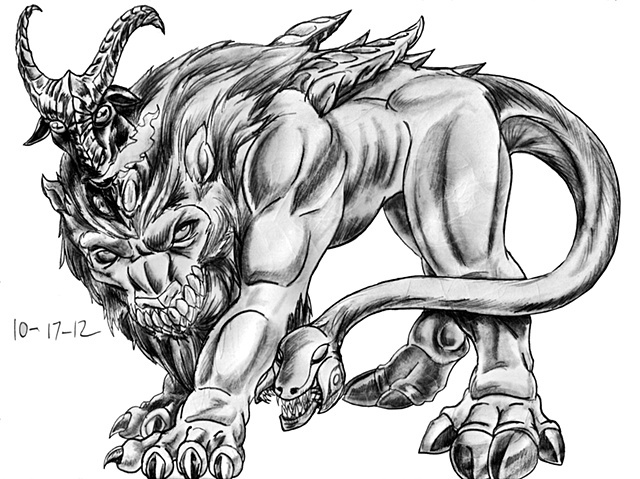 The Chimera is spite of sporting a masculine mane, is a female monster that terrorized the citizens of Lycia, until Bellerophon came to slay the beast. Bellerophon, at the request of f King Iobates of Lycia, flew with the winged horse, Pegasus, and while evading its fiery and poisonous breaths, Bellerophon shot arrows at the great beast, but they weren't very effective. Finally, Bellerophon had an idea. He had a spear with a large block of lead made, and on Pegasus, flew as close as he can towards the Chimera's breath and hurled the spear at its fiery throat. Upon burning the spear, the lead melted, coating its throat, thereby asphyxiating the beast to death. This made Bellerophon a hero, until he made an attempt to ascend to godhood by entering Mount Olympus. Zeus, angered by this presumption, changed into a gadfly and stung Pegasus, sending Bellerophon crashing into a thorny brush, and lived out his life as a poor hermit. My version of the Chimera is essentially using the myth and just changing its features to suit my tastes. Like having the lion head's teeth outside her mouth and the goat's head being like a weaponized unicorn horn, with the snake tail running interference.